Discussion in 'Skins' started by Faruga, Jan 21, 2012. The Centurion would play just like Pit. A. The Centurion plays nothing like Pit. A. He shoots arrows just like Pit. B. Perhaps it can be programmed he's always crouching. A. But doesn't get a single other powerup and the arrows it does have are weak beyond all recognition. B. That's just silly. It'd make more sense to make it a Link skin, if at all anyway. This specific argument is incredibly silly. I, personally, do not recall when a T-Piece from Tetris was also a tank and could fly around firing line blocks at unsuspecting Goombas. I also don't quite remember the part in Castlevania where the whip skeletons could use all the sub weapons, let alone any of the various robot masters and doctors from Mega Man being able to use any of the special weapons from that. In my eyes, skins are not supposed to be 100% super strict canon, and more just a way for you to enjoy a character looking like something else you love. Otherwise, every character skin would have to act exactly as they did in the game they came from, and as interesting as that would be, it would probably take years to make perfect with the amount of skins in the game. After all, what if I want to play as SMW Mario? Do I get to use my cape powerup? Dimpsy, Rey D, Faruga and 3 others like this. 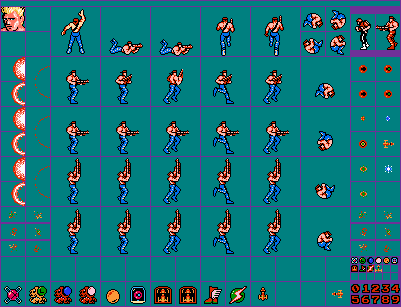 First, hopefully if skins are ever added again we will get these custom 16bit NES sprites. Second, where is the "Official" tag for this thread? where is the "Official" tag for this thread? I already finished that skin and posted it to the wiki. I'm not able to find it. EDIT: I think I found it. Is it the first in the list under skins currently in the game? Did you make any changes to it? Yeah, that's it. All I did was add the crouching and climbing sprites. Here's my progress on my first skin done in GIMP. It's a simple cut and paste of Samus resembling Bill. Please comment on the work so far. What am I doing right and what am I doing wrong? I'm still new at this and want to be sure I'm not doing anything wrong. I created a separate layer for all the Bill sprites to go on. So if I need to readjust them, I'm not sure how to do that. Also, I'm not sure what all the animation frames are. So I would appreciate any assistance regarding my concerns. Thanks in advance. @Mitewing Why is the image so small ? It's not in the original resolution. No clue. I wondered that myself after I tried to open it again. 2 hours work wasted. Ugh. Has anyone tried to make a 16bit Zero Suit Samus based on Zero Mission? BBQTurkeyzZ, Mitewing and Mariofan5000 like this. Will Samus fit in the frames where she aims straight up? Here's a 16bit version of the NES Samus which would be cool to see if you're froggy. What about the ones I made a while back? Sorry. I don't recall. On what page are they on? Are they on the wiki? mariofan2020 and I both have completed skins posted to the wiki.